If Michael DiPietro wasn’t already on the radar for some teams, his performance in the first round of the OHL playoffs against the London Knights should go a long way in demonstrating how effective his game is. He played 51 games in the regular season for the Spitfires with a .917 save percentage and 2.35 goals against average. He backed that up with similar numbers (.917 and 2.48) in a tough seven-game series against the defending OHL champs – the London Knights. At just 17, he has time to grow. At six-feet tall, he’s an average sized goaltender with size being a significant commodity nowadays in netminders. While his size can be a knock on this young goalie, his quickness and ability to make himself look big to incoming opponents. It didn’t take long for DiPietro to climb to the top of Windsor’s depth chart. 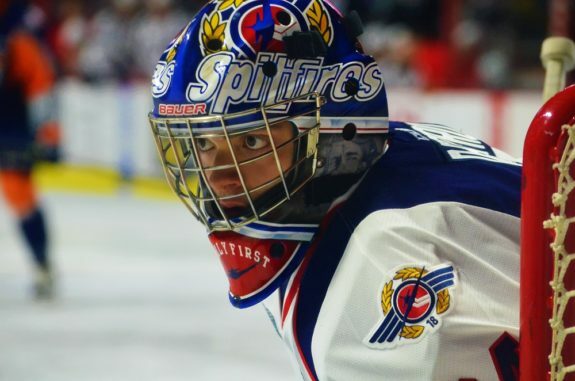 After his rookie season in 2015-16, in which he played 29 games, DiPietro took on the starting role for the Spitfires. Like Carter Hart (drafted to the NHL in 2016), DiPietro will have to continue to use his size as motivation as he looks to excel at the next level. He’s demonstrated the ability to steal games which can be valuable in a goaltender, but he still isn’t the top ranked goalie in this year’s draft. He’s likely going to be a mid-second or early third round pick, depending on the necessity for goaltending. While his size will definitely play against him at the goaltending position, his confidence could end up landing him a starting job down the road. Worst case scenario is that he finds a job as a platoon goalie in a 1A-1B system like a number of teams use in today’s NHL. As an OHL rookie in 2015-16, DiPietro won the Dinty Moore Trophy with the OHL’s best goals against average for a rookie goaltender. He was named to the OHL’s first all-rookie team and even notched the best goals against (1.75) in the under-17 World Hockey Championships as a member of Team Canada.